IT IS HERE AND READY TO IMPRESS YOU! THIS VIDEO SHOWCASES OUR 1ST PROTOTYPE! THE CURRENT SYSTEM HAS BEEN UPDATED! This development is the next generation applied to Jerry Glaser’s legendary understanding of tool steels, tool shapes and modularity! 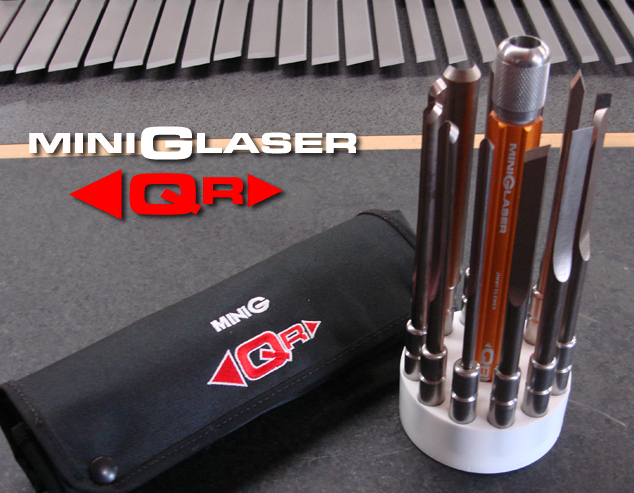 The miniGlaser QR system is new, is fresh and it is clever! It is a complete departure from what is in the market today. You can say goodbye to the Allen wrenches and set screws. The system offers a whole new concept in reliability and modularity. It consists of 9 tools encased in our worldwide patented adapter holding system, which is machined to extremely high tolerances. The handle serves as a unique holding device, the design of which is totally new to the industry. The entire system is offered in a custom personalized pouch, which is extremely compact and highly portable. Our entire system weights slightly over 4 lbs. The tools are made from our flagship steel (CPM10V)l and then subjected to a proprietary treatment which, greatly enhances the edge performance and protects the finish against rust and corrosion and adds natural lubricity to the steel. The handle extrusion maintains Jerry Glaser’s visionary lead shot filled system and the no-roll design. The lead filled handle is designed to absorb vibration and reduce stress caused by harmonics and most importantly reduces fatigue. It will come filled with approximately 20 grams of vibration absorbing lead. Handle color is BLACK. The retail price for the set of 9 tools with our patented adapter, the patented quick release handle system, and custom embroidered pouch is $699. (approximately $77 per tool). Our patent pending QR system is truly the most innovative development in woodturning in the last decade. The miniGlaser Quick Release system is being manufactured at Advanced Theoretical Concepts, Inc. – ATC using some of the most advanced quality control systems available today. BUT, it was Jacques Vesery ( www.jacquesvesery.com) who gave me the insight on how we could develop this fantastic system. I remember receiving a picture from Jacques after he “enhanced” our miniG set of 13 tools we gave him at the AAW 20th anniversary show in Louisville, KY. He cleverly changed the system and made it very modular. And then, he wrapped it in his green navy bag. I immediately contacted him and asked to borrow the little bag. The result is a phenomenal set of the highest quality tools in the world today. So, besides loving this man like a brother, I must say that he was the one who pushed my development. 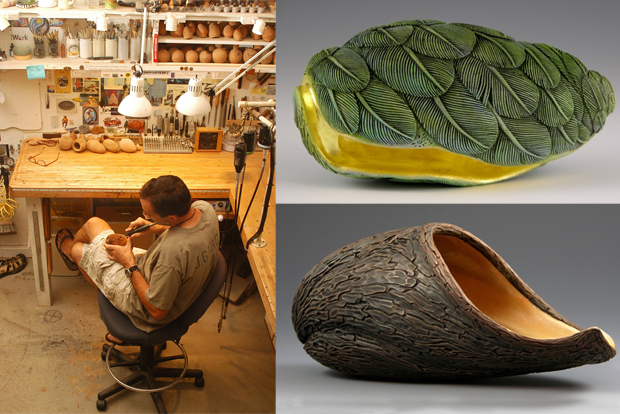 Some of the top professional woodturners will be using this phenomenal tool system. 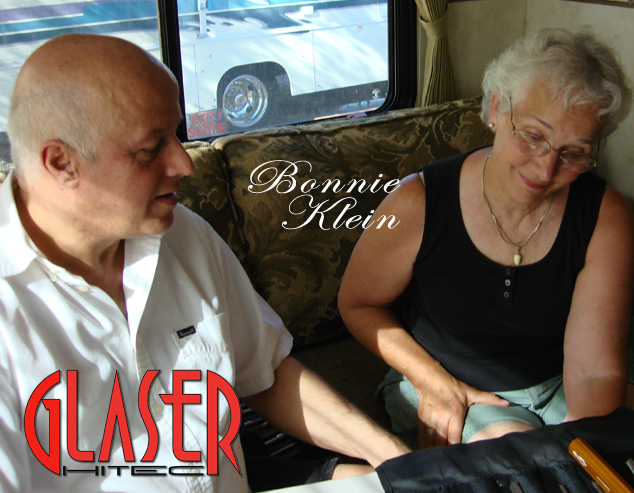 I am honored to have Bonnie Klein be one of the first professionals to recognize the advantage of using this innovative “quick release system”. I am positive you will be delighted as they are with the quality, uniqueness and performance of the set. Enjoy yourself. It’s later than you think! New vibration gel dampening system – no more lead filled handles! During one of our developments with Space Exploration Projects, we were able to create a gel compound designed to protect and reduce vibration in the compartment which houses spaceship components. The result was a state-of-the-art gel formula which replaces the lead in ALL our handles, substantially reducing the weight, but increasing the vibration dampening properties. The handles are now lighter resulting is less fatigue on your turning. A Good Thing To Have! "Other than my marriage, working with Glaser Tools is the best thing that has ever happened to me. They are the only tools I use. Anf it is a good thing that I have enough of them to last me thre rest of my life." Woodturning is a potentially dangerous activity. Improper use of tools and/or equipment, as well as not following recommended safety guidelines can result in serious injuries or death. In case you have questions regarding proper tool use or safety guidelines, please consult an expert. At Glaser Hitec we want you to enjoy our products observing the proper safety procedures! Email address: You may find the unsubscribe link within each email sent from us!